My wife said no one but me would get today’s cartoon because I must be the only one that can go to bed and be chilled and in the middle of the night tear the covers off me because I am burning up. I said she was the odd one who went to sleep and woke up cold even though she insists we keep our house on 73 degrees in the winter. How can I even be chilled when going to bed? Well, my mother said my wife has wussified me because when I was living with my parents the thermostat barely went over 67. 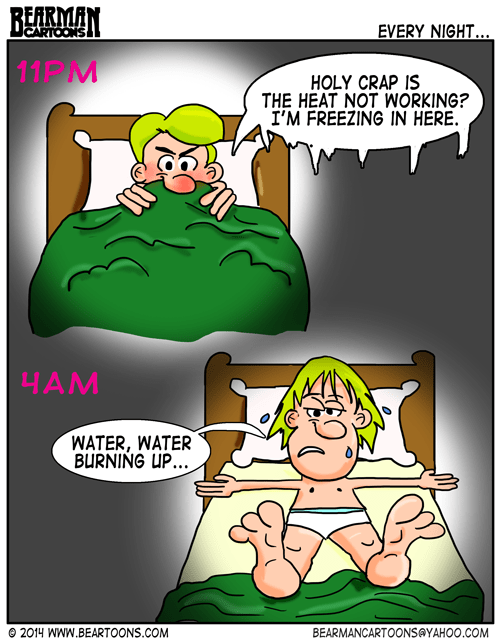 Anyone else get the night sweats? Weird, because this happens to me quite often, too. I must have caught it from you! Totally get it. You are not alone. Opposites attract and that includes warm blooded to cold blooded. This is the process at our house as well. In the summers I have been able to get the use of the ceiling fan which is helpful. It only happens to me because my wife secretly turns on the bedroom heater while I’m asleep, thus leaving me to wake up feeling like I’m trapped in some fiery pit. Every night unfortunately! I sleep with the bedroom window open because hubby now sleeps in the living room (due to back & digestion problems he can’t lay flat anymore so he sleeps in his recliner). I have only a sheet & comforter on the bed. Most of the time I fall asleep with the sheet over my body & my feet hanging out because I’m too warm. Once in a while I will wake up cold in the middle of the night & pull the comforter over me too but it’s pretty rare. We live in an apartment building with boiler heat but individual thermostats. We have always found this apartment too hot in the winter & prior to the last week had never turned our heat on during the entire winter. This last week we had a cold spell & hubby is starting to show his age & got chilled so he put the furnace on! All I can say is thank goodness we don’t sleep in the same room anymore – his body heat would put me over the edge! I usually don’t need any covers except on my feet. I don’t think we needed to know that. Whatever it s! Hubby & I both take a “pill” every day for reflux too, but hubby hates to take pills so he often forgets! and that is why he has to sleep in the chair. Sounds like if you can afford it you need an adjustable bed. Yeah, I do. I’ll often wake up about an hour or so before I’m supposed to wake up because nature calls and instead of climbing back under the covers, I’ll just throw a pair of slippers on and flop on the bed until it’s time to get up. haha Nature can wait. I can hold it. Happen to me last night. I blame it on eating a huge dinner a half hour before going to bed. Usually I blame it on alcohol but I didn’t drink last night. We leave the thermostat at 68 degrees all winter long. Hubby is more likely to have temperature issues than I do. Funny how this happens in most households. I could not stand 73. Way too hot. Of course, the temperature in the room will vary from the setting on the thermostat. I have a thermometer on the night stand and have seen a difference of more than 5 degrees from the thermostat setting which is a floor below. I heard that it is healthier to sleep in cooler temps. I will tell my wife. I know I sleep better if I am cold than if I am hot. It’s usually too warm when I go to bed. If it is I might as well not even try sleeping. It has to be cold the whole night. But as the night goes on I get warmer also. We don’t have thermostats in Germany. I just have to go off of the way it feels in the room. In my apartment we had radiator heat that was typically just on or off. We tended to sleep with the window open in the winter. It’s my every visit to a hotel room in reverse. I think all of them are broken in hotels. I’ve only had this happen when I’ve gone to bed really tired in winter & fell asleep while the electric blanket was on high while waiting for it to warm up. Looks like you are a man of extremes or maybe you have your own personal global warming happening. Mal and I turn the thermostat down to 63 every night and still wake up over heated and have to toss off some blankets at times. I often think the thermostat’s broken ’cause the furnace stays on for a looooong time it then gets too hot for awhile. One foot out of my sheets, a fan on with the heat on 80.. That’s been my trend all winter here in Ohio. 57 degrees at night and 67 during the day during the winter. I’m actually the opposite. I can start out the night warm and toasty and thinking, “I don’t need a blanket.” Then, around about 4 AM, my chattering teeth wake me up and I have to hop out of bed on my frozen feet and get back under the covers. I’m usually the opposite, but the point is, the temperature is never right!! This was me this morning! It is better to be cold and get under the covers than hot at night. I like it when it is a bit cold.